Happy Meal and I were in need of sustenance, and the Culver City Food Truck Festival seemed like just the right place to go on a Friday evening. We found ample, free parking on the street, but we could have parked within the fenced area at no cost. Happy Meal was in the mood for cheese balls from the Cheeseball Wagon, while I made my way to the MeSoHungry truck to order up The Monster burger. "The Monster Burger" was a misnomer for what was actually a pretty standard, 8-ounce burger with standard toppings. I could have paid $13 for a combo, which would have included fries and soft drink, but an additional 4 bucks for fries and a can of Diet Coke ($.65 worth of ingredients) was too much for me to shell out. I suppose the 9 dollar price tag for a cheeseburger from a truck was a little monstrous. The wait was about 10 minutes. "Get ready for the bite of your life. The MeSoHungry Truck was created by a top chef and team of Westside “foodies” who are committed to bringing quality gourmet food to the masses without the gourmet price. Using only fresh high-quality ingredients, MeSoHungry serves up a fusion of world flavors that pack a monster-sized punch. Whether you’re on the hunt for the city’s best marinated short rib slider, tuna sandwich, or sweet potato fries, you’ll come to expect the unexpected from MeSoHungry. We’re experts in delivering the “sneak attack”: bold flavors, fiery sauces, unlikely combinations, and new “foodie”specials for our dedicated followers....Our food is made to order—and you know what that means. 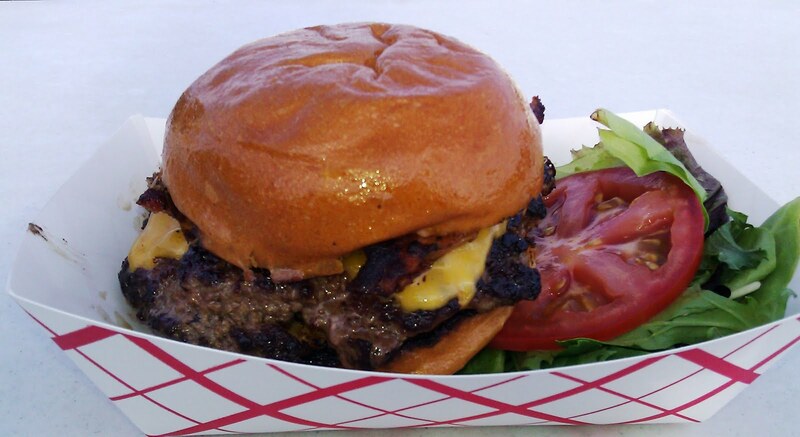 You best bring your appetite for fresh gourmet street food… cuz our menu will make yousohungry!" Expectations and reality were wildly far apart. The Beef: I was informed that the burger was an 8-ounce patty of 100% Angus Sirloin. The beef presented a very mild note of aging and some mineral notes. That was about it, though. The beef was only faintly beefy. It was lacking any of the heartiness associated with Sirloin. My burger was reasonably juicy and not overly oily. 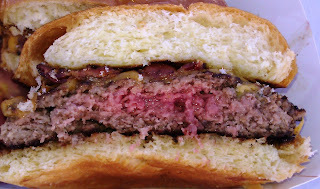 The burger patty was loosely packed, which created a fine mouth feel. The grind was medium-coarse. Overall, the beef was weak in this burger. 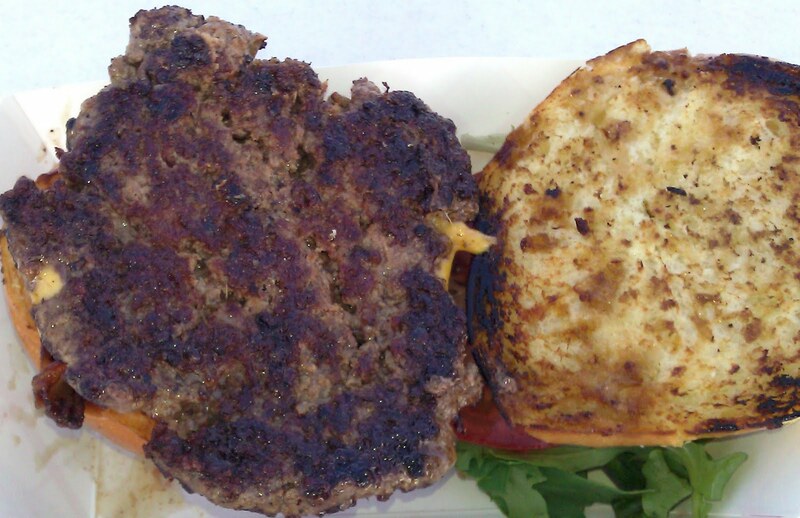 The Seasoning: The bland patty was seasoned as it cooked. The seasoning was moderately salty, but it failed to punch up the burger's flavor. The Sear: The sear on my MeSoHungry Monster Burger was fantastic. It was even, crisp, dark, and thick. The Preparation: I assumed that the beef had been hand-formed into the loose, irregular patties earlier in the day. I did not discover if MeSoHungry ground their own beef. The beef's flavor was uninteresting enough that I didn't want to really dig into the nuances of the preparation. I ordered a Med-Rare burger, and they delivered a burger, which was bordering on Med-Well. This was the cost of that wonderful, griddled sear. I did not request a re-fire. The beef was so insipid that the Med-Rare treatment would have simply resulted in a bloodier version of bland. There were a few bites, which were Med-Rare at the center of the burger, and these were not discernibly better or worse than the rest of the patty. The Cheese: The cheese was mild (boring) Cheddar. The mild Cheddar brought nothing to the party but some additional fat. It was competently melted, but it tasted of nothing. The Bun: The top of the mild brioche-style bun was brushed with oil. I have never understood the appeal of a greasy bun. It was unpleasantly oily on the lips and in the hand. The bun itself was moist and fresh. It was very mild in flavor, and it was only moderately toasted. The mild toasting provided no crunch. The bun only truly developed any crispness at the very edges. The Toppings: Both the mixed greens and the tomato slice were juicy and fresh. The Asian BBQ sauce was about as mild and uninteresting as the rest of the dish. On a sunny note, the bacon was delicious--come on, bacon is almost always delicious. The Value: A price of 9 bucks for a 1/2 pound burger with no fries or drink made the value quite weak at the MeSoHungry truck. While it was a Sirloin burger, it was a boring, Sirloin burger. The Monster Burger from the MeSoHungry truck was an exercise in the uninteresting. Nothing about the cheeseburger stood out. The beef, cheese, and bun were all mild to the point of being boring. That, in concert with the excessive price tag, made this burger one that I would not be inclined to try again. Burger Review : A a very average, over-priced, and over-cooked burger made with gourmet ingredients.